In case you haven’t seen me in the last week, I should tell you that I wore the same Little League T-shirt three nights in a row to baseball games. 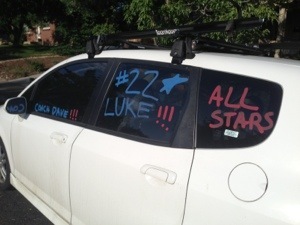 (I even washed it between games.) And I painted my nails in team colors. It’s true, I have fully embraced my role in life as a baseball mom. It’s easy when the team colors are flattering, and the fancy nails worked for the 4th of July as well as the tournament. And by “fully embraced” I mean, “played the part of” because when I saw a bunch of random moms who were at the tournament because… well I am not sure why they were there if their kids weren’t playing. I guess they love baseball or something? Well, I can’t imagine being one of those moms. Or maybe I can, and I am still in transition. I have the laundry down, and the snacks, and the supplies for the posse of little siblings. But today was a sad day because the tournament ended for us yesterday. It’s sad because now I have to wash the car, and remove my nail polish or else look like a weirdo around town. I had planned to do that this morning, but poor Jack didn’t get to participate in painting the car, so I had to let him add some flames to a window today. Now I am not sure when I can wash the car. And I am pretty lazy, but I did already try removing the paint by just rolling the windows down and that didn’t work. So I guess we’ll have to put some elbow grease into it. This job seems like the perfect job to outsource to the children, but that may be too depressing for our young athlete. 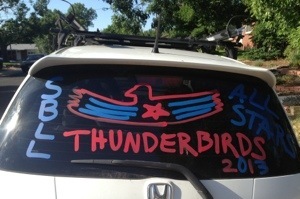 But how about that Thunderbird? Impressive or what? This entry was posted in baseball, Parenting on July 9, 2013 by metamegan. appeared to be on the web the simplest thing to keep in mind of.